We're kicking off our 2nd Annual Oktoberfest Celebration! 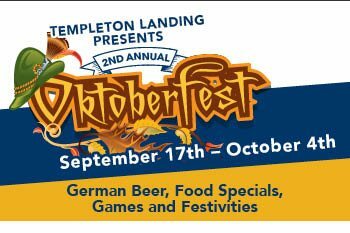 Don't miss out on the German beer, food specials, games and activities we have planned! Monday, September 28th is National Drink Day and we are celebrating with $3 Labatt and Bud Light Drafts ALL day! SRC, founded in 1958 by World War II Army Aircorp veteran, David C. Tallichet Jr., has been an industry leader for more than 50 years with a portfolio of 21 award-winning restaurants throughout the United States. Order your Templeton Landing Gift Cards online and get it delivered right to your email inbox! Join our Loyalty Club for even more ways to enjoy Templeton Landing.